Casa de Mira, is a new house, which incorporates the best of traditional Mexican architecture. Its main entryway is through a huge antique doorway and portico with beautiful plantings. It is located on a quiet tree-lined street with no through traffic. It is located in convenient Colonia San Antonio, just a 10 to 15 minute walk to the Jardin, which is at the heart of the historic Centro district. It is a similar distance to the Instituto Allende, Belles Artes, Theatro Angela Peralta, the Biblioteca Publica (the English public library), the craft market and other places of interest. There are excellent restaurants and markets within an easy five-minute walk from the casa. The house is three story, with kitchen, dining room, living room, patio with fountain, half bath and garage on the first floor, two bedrooms and a study on the second floor, master bedroom, reading room, sunroom and terrace on the third floor. A large rooftop terrace with shaded wet bar with small refrigerator and toaster oven, garden furniture, gas grill, and beautiful plantings. Both of the terraces, each with their own tables with umbrellas and chairs, have magnificent views over the city. The roof-garden terrace also has a chaise lounge and comfortable chairs for reading and relaxing. The elevator is very convenient for bringing food and dishes from the kitchen to the terraces on a tea caddy bought for this purpose. It is a wonderful experience to be on either of the terraces as the sun is going down and watch the lights come on in San Miguel including the beautifully illuminated Parroquia and the Church of the Immaculate Conception. The casa is fully equipped with two television sets, radio with CD Player, DVD, a computer (with high speed internet access) and printer, washing machine and dryer. The kitchen has a range, microwave oven, toaster, toaster oven, blender, juicer, pressure cooker, food processor and everything else needed for making delicious meals. The house is fully furnished with premium quality furniture and furnishings, and is decorated with paintings and other artwork by well-known artists, many of them local artists. The walls have been painted in typical traditional Mexican colors and the rugs have been made to order to match the colors of the house, its paintings and its furniture. The rental includes maid service twice per week and all utilities. Daren and I twice rented a house around the corner from our casa, and we loved it and San Miguel so much that we decided to buy a house of our own in the area. The weather is always so beautiful in San Miguel. This part of Colonia San Antonio is great, and we feel very safe. There is good food shoping and many fine restaurants right in the neighborhood. San Juan de Dios Market is less than a five minute walk from the casa. We have met a lot of Americas and Canadians in the area, and we also enjoy fine Mexican friends and neighbors. 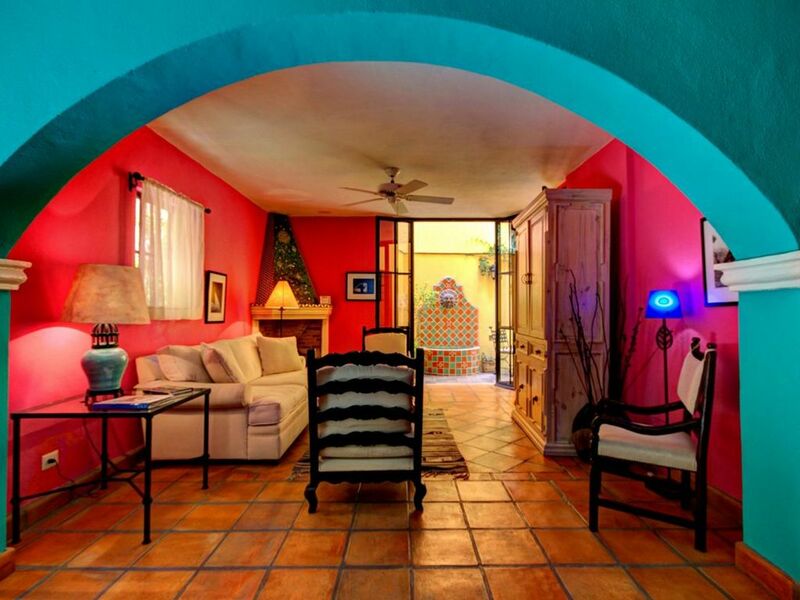 Our house is decorated with beautiful Mexican colors and paintings by local artists. There is a fountain in the ground floor patio and a garden top floor terrace with wet bar where we enjoy evening drinks and most of our meals al fresco. The views from both the third floor terrace and the top floor terrace are magnificent. We bring our meals from the kitchen to the top terrace in our elevator. Our street, Calle Alameda, has no through traffic and is very quiet. It is an easy 10 to 15 minute walk from our casa to the Jardin, a garden plaza which is the center of communal life in San Miguel. Mariachi bands play there every night and people come to dance, stroll, sit on the benches and chat, or just observe the many people who gather to spend a pleasant evening. toilet, shower, Water purified and pressurized. toilet, combination tub/shower, Water purified and pressurized. toilet, This is a half bathroom on the ground floor. Local land line and, Skype for long distance. In addition to gas burning fireplaces, we have four electric heaters. Both down and polyester comforters. A small car can be parked in our garage. There is usually plenty of parking on the street right outside our casa. Locked garage suitable for small car only. (2) The second refrigerator is a small refrigerator under the wet bar on the top terrace. One toaster and one toaster oven in kitchen and one toaster oven on wet bar on top floor garden terrace. We have a well stocked pantry with salt, pepper, spices and condiments and we provide paper napkins and bottled water. In armoire in living room next to the television set. (3) Small balconies off each bedroom. First floor patio with fountain, table and two chairs Third floor terrace with tables, sofa and chairs. Top floor garden terrace with wet bar, table, chairs and lounge chairs. four gas fireplaces, fully equipped wet bar on roof terrace, fountain in ground floor patio. Gas barbecue on roof terrace. Water throughout the house is purified and pressurized. Loved the artistic and authentic decor. True to the character of SMA. Well appointed. Loved the rooftop terrace for morning yoga and sunset. Slight problem with not enough water upon arrival and it was quite a 2 day ordeal to get more delivered. Easy 15 minute walk to the Jardin. Had sufficient heaters for cold mornings. Check with owner as to the status of construction next door. It was perfect for our group of 5 and we thoroughly enjoyed our stay. Fabulous house, beautifully decorated, comfortable, convenient but quiet neighborhood. Super responsive hosts. I highly recommend staying at Mira’s. We loved our time there and hope to go back again someday. Thank you for opening your house to us. We thoroughly enjoyed our one-week stay at Casa de Mira in early November. Lovely and charming home with beautiful interior aesthetics (loved the colourful walls painted in pink, orange, aqua, and the artwork), comfortable beds, and large rooftop terrace with great views. Very clean. One of our party found the walk to Centro a little far, but the rest of us enjoyed it (depends on one's physical condition); the streets are very interesting and picturesque on the way. Taxis are close by, anyway, should you prefer to cab it. Though we didn't cook all that much, the kitchen was well equipped (it was noted that the knives could stand to be sharpened). The owner was very responsive to all emails and questions. Our party of four stayed in all three bedrooms - they are all comfortable with their own ensuite. There is also an elevator for getting your luggage (or you) up-and-down the second/third floors, or all the way to the roof terrace on 4th floor. Highly recommend! I would stay here again. We enjoyed evenings on the terrace with beautiful views of the city. The housekeeper Lupe is a gem—we arrived late due to weather delays and Lupe offered to do shopping for us while we went to dinner. There are many great restaurants to walk to. We did a day trip to Guanajuato with transportation and guided tour by Chema at SMA ride—wonderful day. We also used them for airport transport. We also had a fantastic homemade traditional Mexican dinner in our casa by Carmen Perez Chavez (carmensma06@gmail.com)—probably the best meal we had—we all got to help and learn the recipes. What a beautiful home! I loved all the vibrant colors, the eclectic artwork, the antique furniture- and all the comforts of home. Even the bathrooms were beautiful! So nice to come back after a day exploring and relax in the terrace soaking up the view. Early risers will be rewarded with the sight of hot air balloons sailing almost touching distance away! What a sight! Can’t say enough good things about this lovely home! Casa de Mira could not have been nicer! Everything was well-maintained and well-organized. You will not go wrong here! All rentals require a rental agreement.